There were neither stockings hung by the chimney nor electric lights hung on the Christmas tree, but under the low ceiling in the little white house consisting of just one 15-foot by 14-foot room, cheer could still be felt in the oven-heated air. That was Christmas in Brick in the mid-1800s, when only a few families could be found in town, and the only tourists were travelers on the dirt road from the coast to Freehold that ran through Herbertsville. 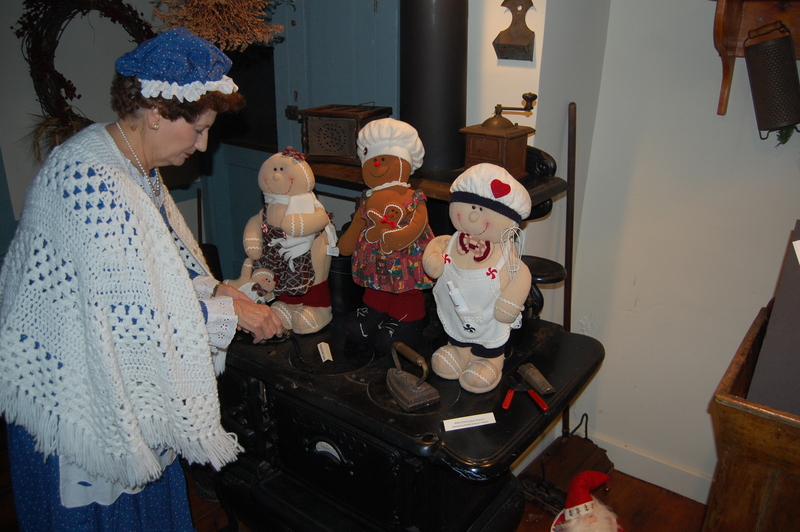 At the Havens Homestead museum, Christmas in Brick, as it used to be, is relived each year courtesy of the members of the Brick Township Historical Society. The museum, the same house with that 15-by-14 foot room (with a loft for sleeping, of course), still sits beside Herbertsville Road as it did when Josiah Havens bought it in 1827. 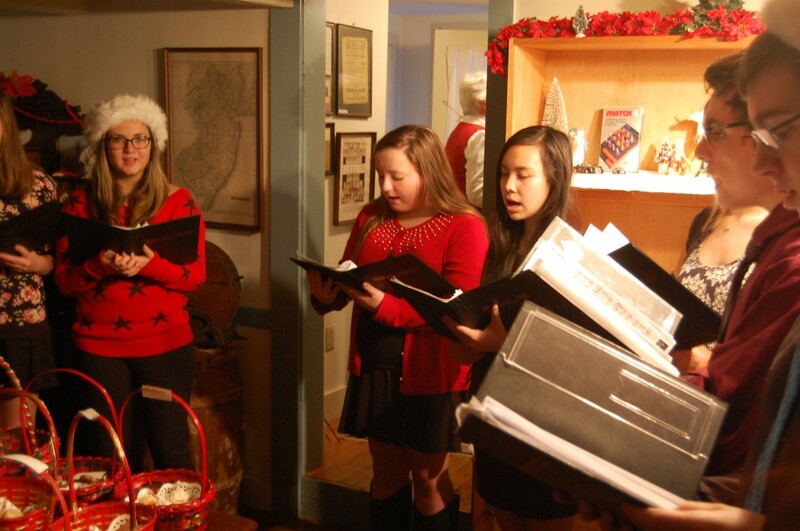 Havens’ two-story, five-room addition built in 1846 was likewise decorated for the season, and on Friday, Santa Claus paid a visit – as the spirits of the township’s modern day residents were lifted by the Brick Memorial High School chorus singing carols just outside the living room. 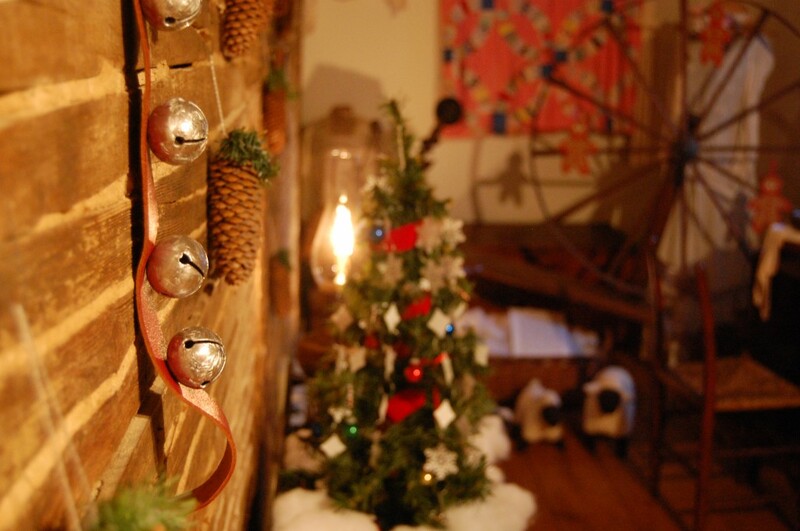 The historical society celebrates its Victorian Christmas each year with a new theme. This year, the Havens Homestead – now a museum – was open on Friday and will open again Sunday afternoon with a theme of “Toys, Trees and Trains, Oh My!,” an homage to Christmas toys through the years. 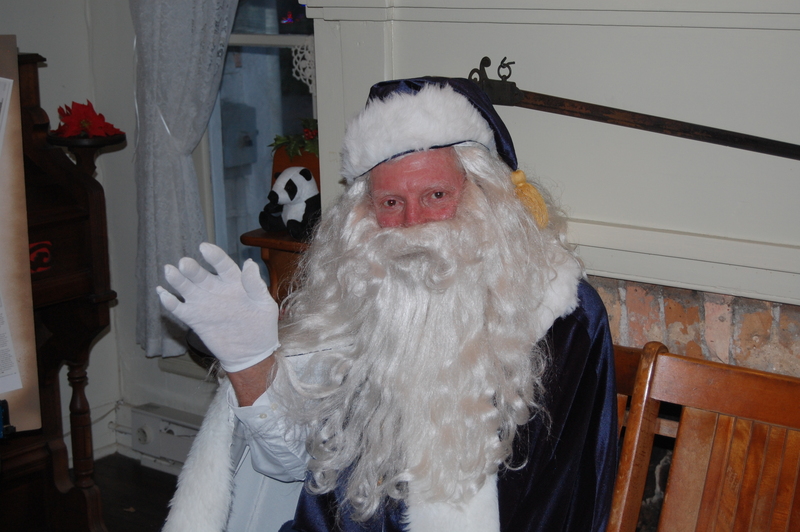 Santa Claus, also known as township resident Tony Capoano, sits in the living room welcomes visitors donned in his Catalina blue robes and wispy white beard – surely recognizable as Father Christmas, indeed, but absent the bright red colors most people associate with St. Nicholas. “You can thank Thomas Nast and the Coca-Cola company for the bright red Santa that we know today, ” explained society member Ann Jolian, of the cartoons drawn by Nast that first depicted Santa Claus in a bishop’s robe during the Civil War before evolving to the shade of red used to the modern era. The red was became more popular in the 1920s when Coca-Cola began running Christmas-themed advertisements in the Saturday Evening Post based on Nast’s later drawings. Santa Claus, a German interpretation of the gift-bearing man from the North Pole, wasn’t yet popularized in America in the mid-1800s. Father Christmas, as he was commonly called, dressed in blue, a tradition carried over from Britain’s influence on the colonies. The homestead, which largely remains in its original state (including the 1846 addition), is decked out for the Christmas season as it would have been in the 1870s, with a cornucopia placed on a mantle just beside the front door, which is flanked by the house’s original 1827 gunbolts. The ornaments are simple-but-elegant, indicative of the era. The alternatives, Fabach explained, included popcorn, cranberries, paper and tin ornaments which were often homemade. The Havens family remained in the house into the 1980s. Olie Havens, the youngest grandson of Josiah, died in 1986. The property remained owned by the family until Olie’s son, Elmer, and his wife Gertrude donated it to the society in 1993. 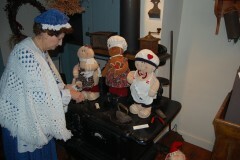 The annual Christmas celebration evolves each year just as the Havens family did, with new exhibits added every season. The upstairs bedrooms of the homestead this year feature children’s toys that were popular during Christmas seasons through the decades, including working toy trains, 1950s tricycles from Germany and the precursors to some modern toys. A working replica of the Blue Comet train, which once traveled from New York City to Atlantic City, whirls around the downstairs Christmas tree beside Capoano’s chair. Through the air wafts the smell of fresh hot cider and fresh-baked cookies and sweets, a modern treat to visitors. Those who want to pay the homestead a visit can do so on Sunday from 12 noon to 4 p.m., when it will be open for guided tours. Santa Claus will again be making an appearance. Havens Homestead is located at 521 Herbertsville Road, Brick. A suggested donation of $5 is requested to support the historical society.